In order for any retail business to be successful there retail shop must be most functional and attractive. Whether you are building a new store front, expanding your present store, or renovating an old business finding the best shopfitting company to turn your vision into a functional and eye catching reality is important. For people living in Queensland and the surrounding area, Gold Coast Shopfitting is the company most retailers choose to meet all their shop fitting needs. This company’s experienced and highly trained personnel can really make your store stand out, while making it highly functional so that it meets the needs of your customers and your employees. 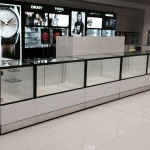 Unlike many other shop fitters Gold Coast Shop fitters start by getting an overall impression of your stores size, the individual needs that your retail shop has, and your vision of the type of space you would like to create. All these things are taken into consideration as we work with you on the planning and design of your store. We work closely with you to determine just what equipment your business will need and how that equipment will fit into your overall shop layout. At Gold Coast shopfitting we treat every customers business as though it were our own and we incorporate all our expertise to ensure your retail store has the most suitable design for the function it will perform. We have expertise in the following areas that we bring to bear to ensure the very best for our customers and their business. * Interior design- we can show you how to make the most of the space you have while still making your store feel comfortable and look appealing to your potential customers. * Manufacturing and building of shelving, counters, and even bespoke furniture that shows off your wares and your shop to the best advantage while giving you the space you need to properly display your merchadise. * Signage and Fittings- Making sure your signage and fittings are keeping with your overall décor and design of your shop is an important part of our job. There is no detail that we consider unimportant as we know that even the smallest of details can make a huge difference in the look and function of your shop. * Purchasing Retail equipment- We also know that right retail equipment can make your store stand head and shoulders above other shops. It can also make your business flow smoothly even on the busiest of days. 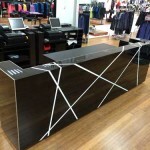 There really is no job that is too large or too small for Gold Coast Shopfitting. We take equal care with our work whether you are small mom and pop store or a large mega shopping retailer. We built our reputation on quality work and customer satisfaction and we are proud of that reputation and will do everything in our power to maintain it and ensure that you are 100% satisfied with the work that we do. So when you are looking for shopfitting for your new or existing business, make sure to choose the best shopfitting company around.